In this Devil May 5 Trophy Guide, we’ll be showing you all the Trophies and Achievements there are in the game. Devil May Cry 5 is an action-adventure hack and slash that follows Dante, Nero and V as they fight demons in fast paced combat. A character called “V” calls upon Dante to help solve a series of demon occurrences. Meanwhile Nero has his own demon hunting agency, now hunting for a hooded figure, a strong demon by the name of Urizen. 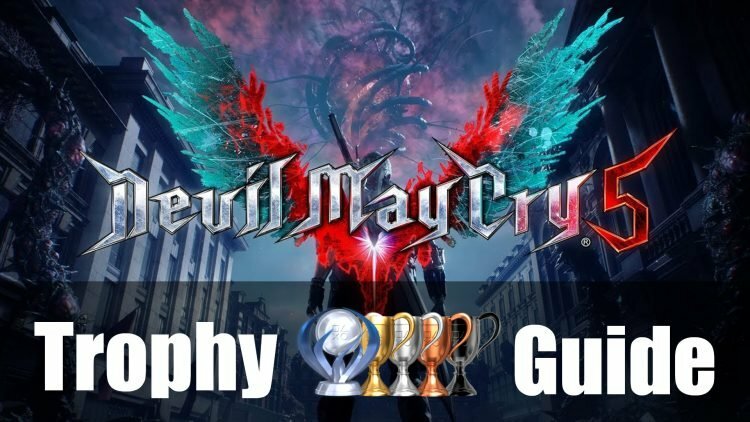 Use this Devil May Cry 5 trophy guide and roadmap to achieve platinum or 100% the game and collect the 49 trophies. Defeat all the enemies in Mission 01. If you’re eager to 100% some other titles you should stop by our Trophy Guide section as we have guides for Resident Evil 2, Soulcalibur VI, Darksiders 3 and more! If you want to know what we thought of this game be sure to check out next Devil May Cry 5 Review: Ssstylish Perfection.